The aim is to stack all the same suit playing cards in increasing order on each of four free places in playing field corners. 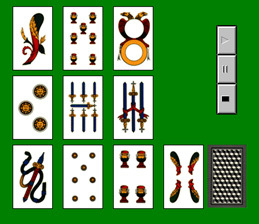 During the game the stacked cards can be reused if it is necessary to do. On starting, the game puts 5 random cards in as many free places in table so making a cross. The remaining cards are not showed. You can turn one a time and put them in appropriate corner, if it is possible, or in the cross following the short-long rule, or in a discarded pack of cards for later reuse. Always you can move all showed cards if the move is allowed.